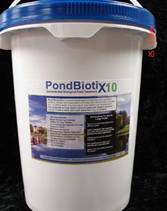 PondBiotix Pond Treatments - ProBiotics For Your Pond! 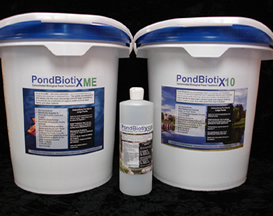 Our new PondBiotix series of biological products are some of the most concentrated and powerful forms of natural pond treatments that you'll find in the pond care industry today. With enhanced performance and pond balancing power, PondBiotix represents one of the best opportunities that a pond owner will have to move away from toxic chemical treatments for many pond problems including pond algae control issues. They are, in simple terms, like probiotics for your pond! PondBiotix represents a complete pond cleaning system that will make your pond incredibly resilient to algae problems once it becomes balanced, and as it becomes balanced you can visually see the difference as the pond clears. It's also well known that muck and organic debris at the bottom of the pond creates a perfect breeding ground for high nutrients that feed more algae growth. And with our muck elimination formula, you can now target this ever-growing problem more directly than ever before. Listed below you'll find various formulations designed for specific sized ponds as well as products designed for nutrient reduction, phosphate, nitrite and ammonia neutralization, muck and sludge reduction and overall pond balancing. Singularly or combined, our PondBiotix products represent a new level of performance in natural pond management! 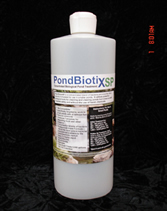 *All biological products, including PondBiotix work best with adequate and proper aeration in your pond. Brand new and more powerful than most natural pond treatments, PondBiotixSP is specifically formulated for small ponds making it safe for fish, pets, and people. Small pond systems can be challenging to keep clean and free from unwanted growth and green water but using a beneficial bacteria is one of the best ways to safely move your pond in a better direction. PBSP is one of the most potent and concentrated formulations available for small ponds. It will lower nutrients that algae can feed on, and work to clear the bottom of unwanted muck and organic debris. All of this can lead to a cleaner and healthier pond overall. * Use our pond calculator if you do not know the gallons size of your pond. PondBiotixME is a concentrated, pelletized form of beneficial bacteria that will quickly reduce sludge and muck in any small pond. It's simple and easy to apply. Now available in 5 LB pails, simply evenly distributed the pellets on the surface of the pond and they will sink directly into any muck that's built up at the bottom. Get between rocks and crevices where even powered pond vacuums may have trouble removing organic debris. With routine use, you'll keep your pond in better shape and reduce one of the major sources of algae support in the pond. As with all of our PondBiotix products, ME is safe for fish and wildlife, pets and people. Be sure to use adequate aeration with any of our PB products. The dosage rate below is a suggested amount for a pond that's about 15' x 10' in size, or 150 square feet. You can adjust this ratio based on your pond size. For example if your pond is 5' x 7' or 35 square feet you would use about 2 oz. of pellets and 4 oz. of product for a pond of about 75 square feet. The product is very safe so these are simply suggested guidelines but there's no need to overdo the treatment. You will gain more ground by simply applying the pellets once a month throughout the season for heavy muck build up. 8 oz. per 150 square feet. Water temps must be above 60 degrees F.
8 oz per 150 square feet. Water temps must be above 60 degrees F.
MDC is so versatile that it can be used alone, with beneficial bacteria, and even with chemical herbicides and algaecides to help restore nature's balance in a pond or lake. It speeds up the natural breakdown of organics into simple sugars which can quickly digested by bacteria. 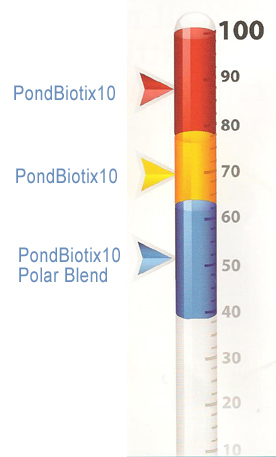 All PondBiotix products are extremely safe when they are used as directed. We always suggest using proper and adequate aeration during applications. Please note that the buyer assumes all risks and responsibility associated with the use, storage, or handling of all pond treatments that may be purchased from KLM Solutions LLC. If you have any questions about our PondBiotix pond treatments please contact us and we'll do our best to assist you.